The pop group, made up of members from McFly and Busted, are working with the 42-year-old singer and musician, as well as All Time Low's Alex Gaskarth, on their upcoming joint album, reported NME.com. 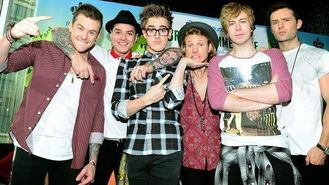 McFly's bassist Dougie Poynter dropped the news on Twitter while speaking to a fan. When asked how the album was going, he said: "Written some cool songs with Alex from ATL and mark from blink." McBusted consists of McFly band members Dougie, Tom Fletcher, Danny Jones and Harry Judd, and James Bourne and Matt Willis from Busted. The group are writing original tracks together after they first formed for an arena tour this year, where they performed songs from both band's back catalogues.